Patiwat Saraiyaem is a 23 year-old student and activist at Khon Kaen University. He was arrested on 14 August 2014 and later charged with lese majeste by prosecutors. He was sent to jail for 2.5 years on 23 February 2015. Patiwat was Secretary General of the Student Federation of the North East. Patiwat, along with a separately arrested and detained activist, Pornthip Munkhong, for their involvement in a political play, The Wolf Bride (เจ้าสาวหมาป่า), about a fictional monarch and kingdom. By 26 October 2014, Patiwat had been denied bail six times. 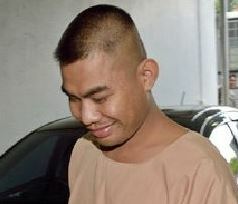 With Pornthip, Patiwat entered guilty please on lese majeste charges on 29 December 2014. In pleading guilty, the defendants requested that the court suspend the jail terms they expect to receive. The court handed out sentences of 5 years, reduced by half for a guilty plea. A lawyer said the two defendants were unlikely to appeal the verdict. In fact, experience shows that an appeal results in further punishment and even torture-like legal processes meant to punish the appellants who are almost always refused bail. Police are reportedly searching for another six people involved in the play, and it is believed that several of them have fled royalist Thailand under the military dictatorship. Patiwat was released on 12 August 2016.